The RCMS system consists of one or more RCMS460-D/-L or RCMS490-D/-L residual current monitors, which are able to detect and evaluate fault, residual and operating currents in earthed power supplies via the related measuring current transformers. The maximum voltage of the system to be monitored depends on the nominal insulation voltage of the measuring current transformer used in the case of busbar systems, resp. depend on the cables or conductors that are routed through. Closed W…AB series measuring current transformers are required to measure AC/DC sensitive residual currents (according to IEC/TR 60755: Type B). Six W…AB series measuring current transformers require one AN420 or AN110 power supply unit. W (closed), WR (rectangular), WS (split-core) and WF… (flexible) series measuring current transformers are used for alternating and pulsating currents (according to IEC/TR 60755: Type A). Any combination of the various measuring current transformer series can be connected to the monitor measuring channels. 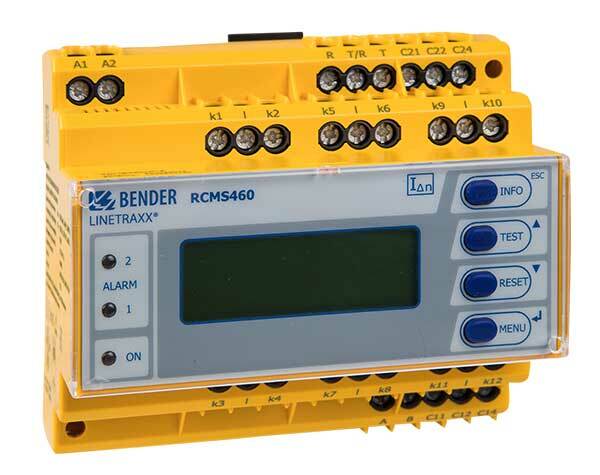 Each RCMS460-D/-L and RCMS490-D/-L has 12 measuring channels. Up to 90 residual current monitors can be connected via a BMS bus (RS-485 interface with BMS protocol), thereby up to 1080 measuring channels (sub-circuits) can be monitored. If this product is to be used for personnel, fire or plant protection, the frequency response can be set accordingly. The measured currents can be analysed for harmonics. Measuring and evaluating residual, fault and rated currents of loads and installations in the frequency range of 0…2000 Hz (W…AB series measuring current transformers), 42…2000 Hz (W, WR, WS WF series measuring current transformers). EMC monitoring of TN-S systems for “stray currents” and additional N-PE connections. Residual current monitoring of stationary electrical equipment and systems to determine test intervals which meet practical requirements in compliance with the accident prevention regulations BGV A3 (Germany). WF… series measuring current transformers consist of one flexible W…F series measuring current transformer and one RCC420 signal converter.